Augustus Garret is the hero of the Alliance, the greatest naval commander in the history of space combat. He leads massive fleets in great battles, but once he was a new captain leading his tiny attack ship on it first mission. The young Garret was driven by ambition and the quest for glory. But war in space is brutal, and the consequences of command decisions can haunt even the strongest commanders. Garret will win his glory, but will he be prepared to pay its cost? 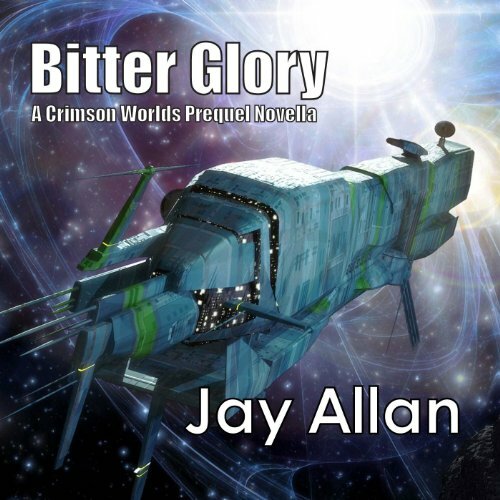 Bitter Glory is not a full length novel - it is a prequel novella set in the Crimson Worlds universe. Who the heck edited this? The Narrator did an OK job. Maybe he was a little lackluster in expression. But the bad part was that retakes were not cut out. Liam would repeat a line or two a few times as obvious attempts to get it right and whomever edited the audio left these retakes in. Very distracting. Then in a few cases, when announcing the next chapter's title it just sounds like the previous conversation continued. It's not until a few seconds later that I realize they moved on. Ugh. Terrible editing. OK narration. Good story. Better characters, better plot, tighter writing, narration with differentiation. The premise is fine. The last chapter gives a history of the universe leading up to this story. It is almost more interesting than the story. The battles are not engaging, and I didn't care about the people. They were not distinct or well-rounded, and they did not include the interesting characters in the first prequel. Who would you have cast as narrator instead of Liam Owen and Sci-Fi Publishing ? Mark Boyett, Jeff Gurner, Jeffrey Kafer, Nick Sullivan. Sci-fi needs to do a bit more cleanup on their recordings. As has been mentioned in another review, there are at least 5 repeats in the audio (the last line or two is inexplicably repeated). Then the readings of the chapter numbers comes so closely on the heels of the last words of the paragraph that you think it really reads: "...and the ship blew up chapter seven." That is an editing/production flaw that seems very amateur. Aren't there industry standards or something about how many seconds to allow between ending a chapter and introducing the next? What character would you cut from Bitter Glory? Doesn't matter. None were distinct or care-worthy. I am sorry for the deaths but I was never involved so I couldn't get worked up about what's-his-name's grief. Jay Allan has a good idea. Perhaps some courses on story writing, or some good work with a great editor would help. Any of my Master's Thesis chair people could help.